Where is the UNE pricing NPRM? All I can find is the press release and the 5 separate statements from each Commissioner. Where can I find the real thing? The UNE pricing NPRM, by the way, is one of the FCC's most significant rulemaking projects, and anyone who is even remotely familiar with the FCC should have known what I was talking about. It is as if I emailed the Department of Defense and asked in which Middle Eastern country the United States had recently fought a war. You are receiving this email in response to your inquiry to the FCC on 9/30/2003 10:23:48 AM. But what about state schools? Parents have always fretted over whether sending kids to less-expensive schools would hurt their postgraduate chances. According to our survey, only Michigan made the top 30, and that's with the help of Michigan Law, one of our 15 elites, taking more than five dozen Wolverines in this fall's class. Among the other well-known names, Virginia was 33, Berkeley came in at 41 and UCLA was 61. "They seem a little reluctant to visit," says advisor Glenn Cummings at the University of Virginia, who says three top law schools he invited to come meet students this year never got back to him. State schools argue that students can improve their chances by enrolling in their honors programs, the "college within a college" option at many top public institutions. Indeed, grad-school officials said beefier course lineups and more rigorous requirements at these honors programs can score points on an application. (Not always: One Harvard Med official told us flat out, "Honors doesn't matter that much to me.") In many cases, the honors colleges don't track how their kids do, though that's starting to change as families wake up to the feeder-school issue. The University of Washington (No. 142) plans to start, partly in response to parent concerns. Still, even if most people don't realize it, there's a bias in favor of some schools that is practically built into the system. At law schools, there's a number called the LCM -- the LSAT College Mean, which tries to identify the students attending the "tougher" colleges (usually Ivies and small liberal-arts schools). With each new group of applicants, it evaluates schools based on their average LSAT test scores; someone with so-so grades from a high-LCM school can wind up looking better than a 4.0 student at a lesser college. Besides, many admissions officers are Ivy alums themselves, says Mark Meyerrose at Admissions Consultants Inc. "They're biased toward elitist institutions because that's where they went to school," he says. I do suspect that there's a bias against state schools at places like Harvard Law. I graduated from the University of Georgia with a 4.0 GPA and a 179 LSAT score, well into the 99.9th percentile. But Harvard initially put me on the "Hold" list for several weeks, meaning that they weren't sure whether to admit me or not. I got my admissions letter from Harvard very late in the process, after I had already sent a deposit to another school. I'm still a bit miffed by that, given how strapped for money I was at the time. I'll never forget the time when my best friend from college came up to visit me at Harvard. He was a recreational therapy major at Georgia, and had no training in law whatsoever. He wanted to see what a Harvard Law class was like, so I took him to my Fed Courts class (with Prof. Richard Fallon). Fed Courts is known as one of the most difficult classes in law school, by the way, and we were in the middle of the semester, so I thought that there was no way my friend would get anything out of the class. But I was in for a surprise. At one point, a student towards the front of the classroom made a comment that showed he had misinterpreted a case. I recognized the error -- and so did my friend. He leaned over to me and whispered a couple of sentences that refuted the student's comment. I was floored that my friend, who had never read a case or been inside a law classroom before, could have a better grasp of Fed Courts doctrines than a Harvard 3L. But I should have known better -- my friend was lightning quick at picking up ideas and running with them, even if on paper he didn't have the statistics or resume of a typical Harvard Law student. I wish the people on the admissions committee could have taken note of that. Here's an inspiring story about the Providence String Quartet, which lives and plays music in inner-city Providence. I hate legal pads. And I'm going to write a little rant about them. They are usually yellow. I don't like yellow. In fact, I don't like any color for paper except white. There is no good way to move from one page to the next after filling the first page with writing. If you remove the first page, then it isn't part of a notebook anymore and you have to find somewhere else to put it. But if you flip it over the top, all sorts of unmitigated evils result. First, it is difficult to keep the flipped-over page(s) aligned and in place. It often looks sloppy. Second, as you flip over additional pages, you end up with a huge tubular shape at the top of the legal pad. This is both unsightly and unwieldy. Third, when you go back to read material that was flipped-over long before, the pages simply won't lie flat any more, having become permanently bent. This creates even greater unsightliness and unwieldiness. There is one way to avoid permanently bending the paper out of shape. This is by placing the legal pad flat on a table, and then gently lifting each used sheet so that it rests on the table above the legal pad, rather than pulling each used sheet around to the back in a tight curve. This results in a sort of inverted Nike "swoosh" shape, which is less unsightly. But -- here's the rub -- it is even more unwieldy than ever. The slightest movement to the legal pad may make the used sheets flip back into their original position, perhaps causing you to lose your place. There is no effective way to use the backside of any sheet of paper. A spiral-bound notebook avoids all of these evils. They are almost always plain white, which is much more suitable than yellow. When you are done with a sheet of paper, you simply turn it around to the back in a smooth motion. After you have moved to the next sheet, the entire notebook still lies just as flat as ever, with no tubular shape anywhere in sight. When you go back to review previously-written material, the pages retain their elegant flatness, due to their never having been excruciatingly bent out of shape. And finally, you can use both sides of the sheets of paper, doubling the available writing space. Even if you normally prefer to write on one side, you still have the left-hand side available if you need to write an additional point for which there is no room on the right. I have given the matter much thought, and I have concluded that legal pads have no redeeming value whatsoever. In every imaginable respect, they are inferior in both form and function to spiral-bound notebooks. I've often thought, is there any reason that we lawyers use legal pads, other than that we've been fooled by the name? Surely there must be some explanation less utterly nominalistic than that. There now. Nice to have that off my chest. Shifting from an income tax to a consumption tax would offer major simplification advantages. Even if Congress created as many preferences and other special rules to what it has under the existing income tax, the massive set of complications that relate to realization and to the taxation of financial transactions would largely be eliminated. The main (though not the only possible) reason for opposing such a shift is the concern that it would require reducing progressivity. However, the capacity of a consumption tax to achieve progressivity comparable to that of an income tax is widely misunderstood, for two main reasons. First, a consumption tax purportedly exempts "capital income," seemingly raising the specter of its exempting the likes of Bill Gates and Warrant Buffett. As recent tax policy literature has shown, however, the only difference in theory between an income tax and a consumption tax pertains to the risk-free return to waiting, which historically has averaged less than one percent per year. The point made by this literature is by now familiar and well-accepted in some circles, but in others it remains unfamiliar or has been unduly dismissed. This article aims to win it wider acceptance. Second, many believe that wealthy people escape the burden of a consumption tax by deferring their consumption, and that advocates of such a tax ignore the effects of unconsumed wealth on one's security, political power, and social standing. The argument overlooks the fact that what makes wealth valuable is the real purchasing power that it commands. Otherwise, real money would be no different than Monopoly money. A consumption tax affects the purchasing power even of unspent wealth, and the burden it imposes generally is not reduced by deferring one's consumption. Christianity Today has a lengthy interview with 11th Circuit nominee William Pryor. Thanks to Lawrence Solum, I see that my good friends Rick and Nicole Garnett of Notre Dame Law School have a couple of new articles in progress. Nicole's article is titled "Property Regulation and the Public Order," and is available here (Word format). In it, she examines the usefulness of property regulations in maintaining public order. I was particularly intrigued by the section on "Jane Jacobs and the New Urbanism," which discusses the effects of architecture on crime control, etc. Definitely worth a read. Rick's article is titled "Religion, Division, and the First Amendment," and the introductory section is available here (Word format). He takes a critical look at the oft-heard claim that separation of church and state must be strictly observed in order to prevent divisiveness. This also promises to be a good read. Justification of an active judicial role overseeing state involvement with religion on the basis of a policy of avoiding divisive entanglements rests upon two problematic factual assumptions. One is that religious disputes and religious people are particularly contentious, so that state involvement in religious matters is more likely to breed bitter conflicts than state involvement in such matters as the distribution of wealth or civil rights. Undoubtedly, religious conflicts have led to wars and persecutions, as have conflicts over secular ideologies like fascism and communism. What is problematic is whether, in conditions of contemporary American society, matters such as school prayers, legislative chaplains, and Christmas displays are more hotly disputed than many secular matters with which state legislatures deal routinely. The second problematic assumption is that courts alleviate divisiveness when they take an issue away from the voters and legislators and decide it on the basis of a constitutional principle. This is a most implausible idea, and such evidence as exists seems to be against it. Many of us find it easier to accept being outvoted by a majority of our fellow citizens or their representatives than by a handful of judges. Legislative battles over the issue of legalized abortion seem to have become more bitter and divisive since the Supreme Court attempted to preempt the issue in Roe v. Wade. The very act of deciding a dispute on the basis of some abstract legal principle rather than on the give-and-take of legislative compromise tends to identify more clearly one side as the winner and the other side as the loser, with the result of increasing the bitterness of the loser. One sure way to encourage conflict on any subject is to encourage people to think that what seem to be minor irritations are in reality violations of some sacred principle for which they have a duty to fight. The Supreme Court's decision in Lynch v. Donnelly, involving the constitutionality of a community's tradition of including a creche or nativity scene in its otherwise secular Christmas display, illustrates the tendency of expansive judicial remedies to generate conflict that might not otherwise occur. The creche had been part of the annual display for at least forty years. The district court found that no controversy existed over it, until local members of the American Civil Liberties Union brought a lawsuit to enjoin its display. Nonetheless, the district court, and the dissenting opinion in the Supreme Court by Justice Brennan, found the divisiveness engendered by the lawsuit itself to be evidence that the Christmas display posed a danger of divisive entanglement, noting that the calm that had prevailed prior to the lawsuit might merely have reflected a feeling on the part of dissatified individuals that it would be futile to oppose the majority. No doubt a sense of futility is a possible explanation for the absence of recorded complaint, but that fact also demonstrates that, by encouraging persons who are easily offended by religious symbolism to believe that the courts stand open to remedy their complaints, the courts foster divisive conflicts over religion. Similarly, by encouraging citizens and legislators to believe that aid to regilious schools is a matter to be decided on the basis of abstract constitutional principles rather than by compromise and accommodation, the Supreme Court may well have made such disputes more bitter than they otherwise would be. That consideration does not necessarily mean that the Court has acted wrongly because justice, not domestic peace, is the primary aim of constitutional adjudication. American society might be more peaceful if the Supreme Court stopped enforcing constitutional rights altogether. Since 1927, the federal government has controlled allocation and assignment of the electromagnetic spectrum, considered the lifeblood of wireless communications. A longstanding critique advocating exclusive property rights in spectrum has recently been joined by an argument for "spectrum commons." Commons proponents claim that emerging technologies call into question the basic rationale for exclusive control of wireless frequencies. Yet both sides fail to come to grips with an essential point: there is no such thing as spectrum. It is an intellectual construct whose utility is rapidly decreasing as new avenues for communication develop. Because spectrum is not a concrete thing, oft-used analogies to land or to natural resources break down. Proposals based on spectrum as a physical asset denominated by frequencies artificially constrain transmission mechanisms, producing inefficient outcomes. A better approach is to draw analogies to legal domains that do not presuppose ownership. The proper focus of wireless regulation is not the spectrum, but the devices that use it for communication. The property and commons regimes are just different configurations of usage rights associated with wireless equipment. Rethinking the spectrum debate in these terms allows a better assessment of the two proposals. It also shows that both are incomplete. There is a vast new communications space emerging, whose full extent is unknown. The way to exploit this “supercommons” is to begin with a fundamental privilege for anyone to transmit anywhere, any time, for any purpose, in any way. Tort and intellectual property principles can effectively manage interference, while efficiently resolving disputes. You can find lots of similarly interesting papers from last week's Telecommunications Policy Research Conference here. The smaller broadcasters, who have considerable influence because they are in every Congressional district and control most of the television and radio outlets that are vital to political life, came out loudly against the rule permitting the networks to buy more stations. And a significant number of religious, consumer, labor and civil rights groups rallied against many of the other rules. Organizations like the National Rifle Association and the Parents Television Council joined in one of the oddest ideological alliances in years and flooded lawmakers and regulators with millions of complaints. "There has been a huge problem with the political lopsidedness of the debate," Mr. Powell said. "People in the opposition are part of a highly vocal and strenuous community. They have relatively strong viewpoints, are very active and mobile." "On the other side, if you are in a fraternity watching TV and drinking beer and happy, what are you going to do to get in the debate?" he asked. "You are not. I think the public is more upset with the media than they are with the rules." Mr. Powell said that he believed that many of the comments flooding lawmakers and the commission were mass-produced by a handful of groups, like the National Rifle Association, which are less interested in the policy merits of the debate than in using the controversy for their own fund-raising purposes. Michael Powell obviously understands public choice theory. And not only that, he is willing to acknowledge it in public by refusing to kowtow to special interest groups. What a remarkable public official. With the help of the American Civil Liberties Union, the pair have sued to find out how they ended up on the list. They suspect their work publishing the anti-war War Times newspaper may have led to their appearance on the list. The Transportation Security Administration denies that, saying no one is targeted for anti-war activism. However, the agency will not discuss individual cases. This is not the first news story covering the lawsuit filed by Adams and Gordon. The Independent did a similar story in early August, prompting a histrionic cry of "fascism" from Nathan Newman and Patrick Nielsen Hayden. But is there any substance to the accusation? It's theoretically possible, I suppose, that one or more of the federal agents charged with creating this "no-fly list" singled out anti-war activists, whether on their own or because of orders from on high. But this seems enormously unlikely. I doubt that any government agent would have bothered to look up all the 31 people associated with some two-bit, anti-war rag. It would be a vast waste of time, given two very large groups of people (anti-war activists and potential terrorists) that might overlap only a little. Of course, those two groups probably do overlap to some extent. Out of all the people whose lives bear some of the genuine indicia of potential terrorists or potential terrorist supporters, surely at least a few are also inclined to engage in anti-war activism. And when those people end up on a no-fly list due to the other indicia, they will be eager to blame it all on a mean-spirited Justice Department intent on persecuting people merely for their political beliefs. Is it a federal blacklist for airlines? Some say it is. People named David Nelson, for instance, may agree. The Transportation Security Administration (TSA) controls a list known as the "no fly" list. Although the names corresponding to this list remain classified, the effect the names are having on airline passengers is no secret. People across the country with the name David Nelson keep being held by security for extra clearance. From Alaska to the east coast, David Nelsons have had to go through time-delaying extra security clearance in order to get on planes. In fact, the Sixth Circuit judge for whom I clerked is named David Nelson, and he is most certainly not an anti-war activist. He is a stately, patrician, mild-mannered, elderly man, with a respected career as a federal judge. A more unlikely terrorist could hardly be found. Yet I'm told (by his son Caleb) that even Judge Nelson has been questioned a few times at airports. Adams and Gordon feared the government was targeting them because they're veteran peace activists and co-founders of War Times, a San Francisco anti-war newspaper. Now it appears that reservations systems were rounding up anyone with a name similar to "J. Adams," including a Virginia attorney (J. Christian Adams) and a young woman (Jodi Adam) who was stopped at SFO the same day as the peace activists, according to TSA complaints and police records. If there is an anti-war activist named David Nelson out there somewhere, we can probably expect an ACLU lawsuit in his name, claiming that he was singled out for his political beliefs. Yet that claim would be baseless, as I suspect the claim of Adams and Gordon to be. With all the thousands of people scrutinized at airports because they have a name similar to a potential terrorist's -- and who could expect the ticketing agent to know the difference? -- it is inevitable that a couple of anti-war activists would end up in the mix. It wasn't until a couple of years ago that I first realized that Diet Cokes -- or any diet drinks, for that matter -- actually taste sweet. For the longest time, I thought that all diet drinks tasted horribly bitter. Then, a couple of years ago, I tasted a Diet Coke and thought, "Wow, they've really improved this stuff lately." The funny thing is, I didn't realize this until just a few months ago, when someone I work with opened a Diet Coke, and said, "Eww, this one's been sitting around too long, and the sweetener has broken down." It was then that I realized for the first time in my life that the problem with my grandmother's Diet Cokes was that they were too old, not that all artificial sweeteners tasted horrible until just a couple of years ago. It was quite an epiphany. An interesting Sixth Circuit decision -- Hood v. Keller -- came out a couple of weeks ago. I didn't write about it at the time, for the simple reason that it hadn't come to my attention. James Hood is a Christian pastor who likes to preach and hand out religious literature on the grounds of the Ohio statehouse. Unfortunately, he did so without securing the legally-mandated permit from the Capitol Square Review and Advisory Board. Thus, on one occasion, he was arrested and charged with trespass in Ohio state court. He argued that the permit requirement was unconstitutional under the First Amendment, but lost. So the state court fined him $100. Hood then decided to file a complaint in the federal district court for the Southern District of Ohio. There, he again raised the argument that the permit requirement violated the First Amendment. The Sixth Circuit disagreed, saying that Hood was not seeking to have his $100 fine reversed. Rather, he was seeking a declaratory judgment that the permit requirement was unconstitutional, and an injunction against future enforcement of that requirement. Therefore, he wasn't "appealing" the state court judgment at all. Because he was seeking relief aimed at the future, he was in the same position as any other litigant seeking to challenge a state law on First Amendment grounds. The Sixth Circuit then remanded the case to district court for further analysis on the First Amendment claims. I think this was the right outcome. Rooker-Feldman shouldn't apply so as to prevent someone from challenging a state law just because he was prosecuted under that state law at some point in the past. To the contrary, someone like Hood should have an even more substantial claim that his rights might be violated by future enforcement. Summer is passing into fall. And thus, we have the pleasure of seeing a new issue of the Review of Network Economics appear on the web. Augustin Ros of NERA has an article on the effect of price cap regulation on Latin American telecommunications markets. Andrew Odlyzko of the University of Minnesota explains why packet-switched data networks are less efficiently utilized than voice-grade networks. Juan Rosellon of CIDE and Harvard has an especially timely article on various regulatory means of stimulating investment in electricity transmission. Multi-Sided platform markets have two or more different groups of customers that businesses have to get and keep on board to succeed. These industries range from dating clubs (men and women), to video game consoles (game developers and users), to payment cards (cardholders and merchants), to operating system software (application developers and users). They include some of the most important industries in the economy. A survey of businesses in these industries shows that Multi-Sided platform businesses devise entry strategies to get multiple sides of the market on board and devise pricing, product, and other competitive strategies to keep multiple customer groups on a common platform that internalizes externalities across members of these groups. Perhaps most important, tens of thousands of people like Lopez have been given title to land that their families have been squatting on for generations, both in poor urban slums like this one and in vast rural tracts. Using new government credits, poor families are planting crops, organizing businesses, fixing up their homes and redesigning their neighborhoods. "There is an incredible flowering of activity in the communities that are participating," said Gregory Wilpert, an American sociologist and freelance journalist living in Venezuela who is studying the effect of Chavez's reforms. The impact of the government's efforts is still haphazard and limited. But the measures have had a ripple effect that has left many of the poor feeling that for the first time in their lives the government is actually interested in aiding them. Giving land titles to squatters is exactly what Peruvian economist Hernando de Soto has been recommending for years, both through his Institute for Liberty and Democracy and through his books (e.g., The Mystery of Capital). I'm a bit surprised that even after doing quick searches on Google and LEXIS, I can't find any mention of whether or not he is involved in the Venezuelan reforms. I'd be stunned if he wasn't, though. On a related note, now's as good a time as any to recommend that you read the speech given by my judge (Stephen Williams) at the American Enterprise Institute on January 7, 2002. It's titled "Radical Reform: Transitions to Liberal Democracy and the Rule of Law." Sen. John Breaux (D-La. ), one of the few Democrats voting against Dorgan's resolution, said the debate over a 35 or 45 percent national cap is irrelevant when top-rated CBS reaches only 3.4 percent of the national audience nightly. "It's like saying an auto dealer in New York has 6 percent of the total sales in the U.S. because New York has 6 percent of the total population," he said. You know the transformation from a normal person into a telecom geek is complete when the highlight of your week is that the FCC released an NPRM revisiting the use of cost proxy models to calculate TELRIC prices for UNEs. I was watching my friend Charles Kesler on "Book TV" on C-Span 2 yesterday -- everyone should own his edition of The Federalist Papers -- and he uttered a wickedly funny line that I reproduce from memory: "One of the categories of books that I despise is management books. You know, Emperor Nero's Ten Rules for Being a Successful Manager." Don't miss the discussion between Eugene Volokh and Lawrence Solum over the nature of intellectual property and why we protect it at all. 2. Property as a limit on others' freedom of action. From this follows another important point: All property that has a right-to-exclude component is a limit on others' freedom of action. If you own your land, this limits my freedom to walk on it. Now we often don't perceive this as limits on freedom of action, because we're used to it, and aren't much troubled by it. But sometimes we do sense it: For instance, when there's talk of taking public beaches (i.e., beaches open to all, with no individual having a right to exclude others) and turning them into someone's private property, people might say "Hey, that means I won't be free to go to that beach any more." Likewise, homeless people who want to take shelter on private property may be keenly aware that the owner's right to exclude interferes with their liberty to go onto that property. All property is a limit on other people's freedom of action. Yes. But IP is also a limit on how other people use their own unrelated property. Because your computer belongs to you, I can't seize it and start using it without your permission. Your property right is a restriction on my actions. But unless I happen to be in the vicinity of your actual computer -- an embodied, specific, physical thing -- there is no chance of that happening anyway. But with IP, the situation is different. If you put a few words together in a particular order as a title of your business and deem it a "trademark," the law might forbid me from putting a few similar words together so as to form a similar phrase, even if I have never heard of your trademark and have never been within a thousand miles of you. This is not just a restriction on my freedom of action, but on the use of my own property. The law here is restricting what words I can print on my own business's promotional literature, what words I can place on the sign in front of my business, etc., etc. In other words, the whole point of invoking IP law is to prevent other people from engaging in speech by means of their own physical property. I can't quite put my finger on it, but this strikes me as odd. I find it irritating when people write things that are intellectually dishonest in support of a position that I agree with. Such as, for example, this article from the American Spectator, which argues in favor of the nomination of Brett Kavanaugh to the D.C. Circuit. I support Kavanaugh's nomination, and have previously written on the New York Times' shameful attempt to minimize his accomplishments. The Spectator article, however, is inaccurate in several respects, particularly in its attempt to portray Kavanaugh not as merely qualified for the judgeship, but as more qualified than previous Democratic nominees. The article correctly notes that Kavanaugh clerked for two prestigious circuit court judges and then for Justice Kennedy, worked for the Solicitor General's office, and made partner at Kirkland & Ellis. All true so far. So, how does Kavanaugh stack up against the sitting Democrat-appointed members of the court? In 1994, Clinton nominated Judge David S. Tatel. Tatel's resume is long, but on close inspection, it appears he wore big hats, but drove few cattle. During Tatel's 28-year career prior to his nomination, he spent 24 years in private practice. According to his official bio, he never clerked for a judge -- Supreme Court, Appellate Court, or otherwise -- and his courtroom experience was from the wrong side of the podium. This portrayal of Judge Tatel is not so much inaccurate as it is unfair. Judge Tatel had a distinguished career before becoming a judge, including being partner at Hogan & Hartson, director of the National Lawyers' Committee for Civil Rights Under Law, director of the Office for Civil Rights in the U.S. Department of Health, Education and Welfare, and a professor for a year at Michigan. This resume does not deserve the "all hat, no cattle" insult. Harry T. Edwards, a Carter nominee, took his seat on the court in 1980. Before his nomination, he taught for a brief stint and was in private practice. As Chairman of Amtrak and as a labor arbitrator, he spent the bulk of his time in business. Only after his nomination did Judge Edwards author four books and publish scores of law review articles. Only after his nomination did he teach at Duke, Pennsylvania, Georgetown, and NYU. This is flatly inaccurate in several respects. Judge Edwards did not teach just "for a brief stint" -- he spent some 11 years as a tenured professor at Michigan and Harvard. He did not spend the "bulk of his time in business" in any sense of that word (he practiced for merely 5 years before entering academia and then the judiciary). It is not true that his four books and many law review articles came only after being nominated. I know for sure that he first published his book Labor Relations Law in the Public Sector in 1974, as well as many law review articles in the 1970s.1 Finally, while it may be technically true that only "after his nomination did he teach at Duke, Pennsylvania, Georgetown, and NYU," that is because before his nomination he was teaching at Michigan and Harvard. Take Elena Kagan, the 1999 Clinton nominee whose blocked appointment is likely what Democrats want to avenge with the Kavanaugh battle. Kagan received her degree from Harvard Law School, and although she clerked for the venerable Justice Thurgood Marshall, her career consisted largely of teaching at the University of Chicago before she became Associate Counsel and Deputy Assistant to then President Clinton. With a scholarly understanding of the law, but a seeming far less practical knowledge of it, Kagan, at the time, was in many ways less experienced than Kavanaugh is today. "In many ways"? This, again, is just not true. At most, Kagan was slightly less experienced in a single arena: private practice. Notice that elsewhere, Tatel and Edwards are condemned for supposedly spending too much time in private practice, while Kagan is condemned for spending too little time there. And notice as well the way that the author diminishes the accomplishment of teaching at Chicago, one of the best law schools in the country. Having had Kagan as my Administrative Law professor, I can say that while I might disagree with her on a few issues, she would have made a brilliant and scrupulously fair judge. In short, Kavanaugh's accomplishments can stand on their own. Those who support him, as I do, should feel no need to diminish the accomplishments of others. 1 Some pre-nomination publications by Judge Edwards: Harry T. Edwards, Arbitration as an Alternative in Equal Employment Disputes, 33 ARB. J. No. 4 (1978); Harry T. Edwards, Labor Arbitration at the Crossroads: The 'Common Law of the Shop' v. External Law, 32 ARB. J. 65 (1977); Harry T. Edwards, The Coming of Age of the Burger Court: Labor Law Decisions of the Supreme Court During the 1976 Term, 19 B.C. L. Rev. 1 (1977); Harry T. Edwards & James J. White, The Lawyer as a Negotiator (1977); Harry T. Edwards, Arbitration of Employment Discrimination Cases: An Empirical Study, Proc. of the 28th Ann. Meeting of the Nat'l Acad. of Arb. 59 (1976); Harry T. Edwards and Barry L. Zaretsky, Preferential Remedies for Employment Discrimination, 74 Mich. L. Rev. 1 (1975); Harry T. Edwards, The Developing Labor Relations Law in the Public Sector, 10 DUQ. L. REV. 357 (1972); Harry T. Edwards, A New Role for the Black Law Graduate--A Reality or an Illusion?, 69 MICH. L. REV. 1407 (1971). FYI, you can buy Johnny Cash's latest album (as I just did), along with a DVD of the haunting and poignant video for "Hurt," on Amazon for merely $14.99. You can also view the video online here. You can read more about the British infrasound experiment at the official website here, and especially here. You can also download one of the pieces of music that incorporated infrasound here, although I doubt you'll hear any infrasound unless your computer has a serious subwoofer attached. It's really weird -- a mix of spoken word, electronica, pointillism (a la Webern), and chords reminiscent of Messiaen. A federal appeals court temporarily blocked the rules from taking effect last week, and lawmakers are moving to overturn the most controversial change, which raised to 45% from 35% the portion of U.S. households a TV broadcaster may reach. Powell suggested that opponents of his reforms — from the National Rifle Assn. to antiwar demonstrators — are motivated by a desire to see their own viewpoints better reflected on television and in the media. Sept. 10, 2003 — For the first time ever, astronomers have detected sound waves coming from a massive black hole in space — and believe the discovery may help resolve a major mystery, the U.S. space agency NASA said Tuesday. The Chandra X-ray Observatory had monitored for 53 hours noise coming from the central region of the Perseus galaxy cluster, according to NASA. The pitch of the sound waves, equivalent to a B-flat — 57 octaves lower than a middle-C and at a frequency far deeper than the limits of human hearing — is the deepest note ever detected from an object in the universe, researchers said. Bruce Margon, associate director at the Space Telescope Science Institute in Baltimore, Md., described the sound at a press conference here as being "a million, billion times deeper than the limits of human hearing." Wouldn't Pythagoras (not to mention Plato, Ptolemy, and Boethius) be thrilled? People who experience a sense of spirituality in church may be reacting to the extreme bass sound produced by some organ pipes. Many churches and cathedrals have organ pipes that are so long they emit infrasound which at a frequency lower than 20 Hertz is largely inaudible to the human ear. But in a controlled experiment in which infrasound was pumped into a concert hall, UK scientists found they could instil strange feelings in the audience at will. These included an extreme sense of sorrow, coldness, anxiety and even shivers down the spine. McCaffrey urges that the most important distinction here is not between the income tax and the consumption tax, but between taxes on inflows (which include both the traditional income tax and the pre-paid consumption tax), and taxes on outflows (i.e., his proposed post-paid consumption tax). The timing issue is critical: If we tax all inflows, we punish people whose earnings are not stable. Someone who earns 2X in year one and nothing in year two ought to be taxed the same as someone who earned X in both years. But given progressivity, a tax on inflows will relatively punish the person who earned 2X in year one, even if he saves half of it for year two. A tax on outflows, by contrast, would tax both of them equally, because the tax would be triggered by spending on personal consumption. "Genuinely progessive taxation is necessarily personal taxation," as Vickrey began his 1947 Agendy for Progressive Taxation. It is simply not compelling, normatively, as a matter of first best theory, to impose progressive taxes on entities, where the ultimate incidence of the tax burden is apt to be uncertain at best, and quite possibly regressive relative to individuals, at worst. He also discusses the problems of taxing corporations on page 122. And then, on page 115, he produces a chart that shows the effective rate of taxation on various income classes -- including the regressive payroll tax of 15.3 percent on all income under $87,000. The results are disturbing: People who earn $15,000 to $36,400 are effectively taxed at 30.3 percent; people who earn $36,400 to $76,800 are taxed at 40.3 percent; people who earn $76,800 to 87,000 are taxed at the highest rate of all: 43.3 percent. All higher brackets are actually lower, because of the phase-out of the Social Security tax at $87,000. Thus, someone who earns $151,500 to $319,500 pays an average of 35.9 percent, a lower percentage than the person earning $36,500. I'm somewhat familiar with the arguments for and against progressive taxation. But no one of whom I am aware really thinks that regressive taxation -- i.e., taxing poorer people at a higher rate -- is the best system. It seems clear that the payroll tax system should be reformed so as to get rid of its regressive nature. Tyler Cowen over at the Volokh Conspiracy links to a short paper by Michael Huemer titled "Why People Are Irrational about Politics." Most definitely worth a read. He begins by asking why disagreements over politics are so widespread. It may seem a silly question, but he points out that most other subjects (i.e., geology, linguistics, algebra) do not have such deep and persistent disagreements.1 He tries out several possible explanations -- including the difficulty of political issues, the divergence of political values, etc. -- and rejects all of them. Huemer then concludes that political disagreements arise because most people are irrational in assessing political issues. I couldn't agree more, particularly in the case of almost all people other than myself. Normally, we think that intelligence and education are aides to acquiring true beliefs. But when an individual has non-epistemic belief preferences, this need not be the case; high intelligence and extensive knowledge of a subject may even worsen an individual’s prospects for obtaining a true belief (see chart below). The reason is that a biased person uses his intelligence and education as tools for rationalizing beliefs. Highly intelligent people can think of rationalizations for their beliefs in situations in which the less intelligent would be forced to give up and concede error, and highly educated people have larger stores of information from which to selectively search for information supporting a desired belief. Thus, it is nearly impossible to change an academic’s mind about anything important, particularly in his own field of study. This is particularly true of philosophers (my own occupation), who are experts at argumentation. Very provocative. Read the whole thing. For no particular reason other than my own amusement, I thought I'd put up the text of Benjamin Franklin's "Rules for Making Oneself a Disagreeable Companion." 2. If when you are out of Breath, one of the Company should seize the Opportunity of saying something; watch his Words, and, if possible, find somewhat either in his Sentiment or Expression, immediately to contradict and raise a Dispute upon. Rather than fail, criticise even his Grammar. 3. If another should be saying an indisputably good Thing; either give no Attention to it; or interrupt him; or draw away the Attention of others; or, if you can guess what he would be at, be quick and say it before him; or, if he gets it said, and you perceive the Company pleas'd with it, own it to be a good Thing, and withal remark that it had been said by Bacon, Locke, Bayle, or some other eminent Writer; thus you deprive him of the Reputation he might have gain'd by it, and gain some yourself, as you hereby show your great Reading and Memory. 4. When modest Men have been thus treated by you a few times, they will chuse ever after to be silent in your Company; then you may shine on without Fear of a Rival; rallying them at the same time for their Dullness, which will be to you a new Fund of Wit. Thus you will be sure to please yourself. T he polite Man aims at pleasing others, but you shall go beyond him even in that. A Man can be present only in one Company, but may at the same time be absent in twenty. He can please only where he is, you where-ever you are not. I wonder if the oral argument in the Court's campaign finance case set some kind of record for most current and former Solicitors General presenting oral argument. The current SG, Ted Olson, argued in favor of the law, as did Seth Waxman, a former SG from the Clinton years. Ken Starr, another former SG under Bush I, argued against the law. I find it hard to imagine that there could have been another case where 4 or more SGs argued. Anyone know the answer? Glenn Reynolds has a cool photo up today. 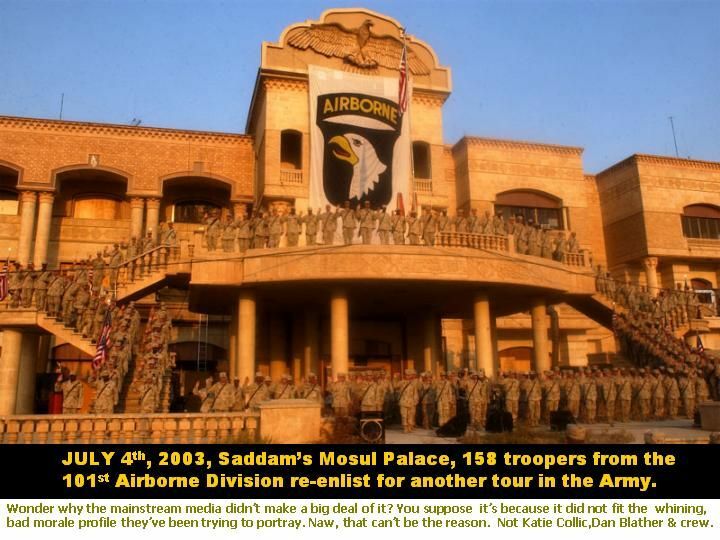 It's titled, "July 4, 2003, Saddam's Mosul Palace 158 troopers from the 101st Airborne Division re-enlist for another tour in the army." He also just came home yesterday, much to my sister's relief (she's due to deliver their son in a month -- one of the 101st's many "Afghani babies"). Out of 26 months of marriage, he has been in the U.S. for only 11. Otherwise, he's been in Afghanistan, Kuwait, and Iraq. Worth reading: Michael Powell's interview with the Online Journalism Review at USC. OJR: There's a long-running debate about keeping some elements the same when news is personalized -- for instance, if there's a major event in your city you should not be able to opt out. Would you draw a line personally? MP: I think it's very difficult to say because the dividing line as decided by who? The value American culture holds highest is that of an individual to make free choice, so the minute you decide there's some value in them not having a choice as decided by who? Who do you want to ask to serve that function? That's why I think we believe in a free press and that's why I think you ought to believe in a free media, because even if there are downsides to private organizations, newspapers, media companies making those decisions, they're better than government making those decisions in our society because you don’t want political discourse skewed with the preferences of the people who have the guns and the money. Gilbert and his collaborator Tim Wilson call the gap between what we predict and what we ultimately experience the ''impact bias'' -- ''impact'' meaning the errors we make in estimating both the intensity and duration of our emotions and ''bias'' our tendency to err. Gilbert does not believe all forecasting mistakes lead to similar results; a death in the family, a new gym membership and a new husband are not the same, but in how they affect our well-being they are similar. ''Our research simply says that whether it's the thing that matters or the thing that doesn't, both of them matter less than you think they will,'' he says. ''Things that happen to you or that you buy or own -- as much as you think they make a difference to your happiness, you're wrong by a certain amount. You're overestimating how much of a difference they make. None of them make the difference you think. And that's true of positive and negative events. 1) It often seems to me that many of the things social scientists study -- "impact bias" and whatnot -- are really just principles of human nature that have always been obvious to anyone of average intelligence with the slightest capacity for introspection and self-awareness. How can anyone ever fail to notice that the new car didn't make them as happy as they thought while on the car lot? 2) I don't know how much impact this "impact bias" really has. The general point I take from the article is that we all tend to overestimate the impact of both positive and negative events. But does this really affect our choices? Why would this matter if the proportionality of utility estimations remains intact? That is, if I'm choosing between two options that I think will be positive, and I overestimate the positive impact of both options to the same extent, I will make the same choice regardless of the overestimation. What would be more interesting would be a showing that we tend to overestimate the positive impact of certain types of events or choices, or correspondingly that we tend to underestimate the negative impact of certain types of events or choices. Or even better, a showing that we estimate certain events as having a positive impact when in reality they turn out to have a negative impact. One of the long-standing conventions of journalism, it seems, is that when someone dies under tragic circumstances, the journalists covering the story will feature lots of quotes from neighbors, friends, acquaintances, etc., all describing what a wonderful person the deceased was, and how awful it is that it should happen to someone like him, etc. Payne, an elementary schoolteacher [and his landlord], said Wells was of "average intelligence" but that "he had a different value system." "Laid-back," she said of Wells's lifestyle. "To be 46 and delivering pizza? He didn't want to work any more than he had to." Payne said Wells called all of his cats "kitty," apparently not bothering to name them. "I always wondered what would happen to him because he didn't have any goals except being Brian and delivering pizza," Payne added. "By 46 you should have your life in gear, but he didn't mind." "I always wondered what would happen to him"! As if being killed by a bomb were only a fitting end for someone so unambitious. According to data published by the Social Security Administration, the name Hillary is the most severely poisoned baby name in history. Hillary had been steadily climbing the baby name charts since the 1960s, when it first graced the Top 1000, becoming the 136th most common name for baby girls in 1992. But the name sharply reversed course in 1993, smashing several longstanding records for name contamination in its plunge from the Top 1000 girl names last year. The title for the most rapid case of name contamination had been held by Ebenezer and then Adolph, names that were shunned by parents after they became associated with Dickens's miserly banker and the Nazi dictator Hitler. But while Ebenezer and Adolph each took over 30 years to fall from the Top 1000 after they were negatively associated with their prominent name sakes, Hillary dropped off the charts in just 10 years, upsetting the prior records in less than 30% of the time. Besides this achievement, Hillary also set records for largest drop in a single year (295 places in 1994), two years (420 places in 1993-1994) and ten years (>864 from 1993 to 2002). These titles taken together constitute the grand slam of name poisoning. The table linked above shows the rankings for the 20 girl names that sandwiched Hillary in 1992. Over the subsequent ten years, some of the names increased in popularity, some declined, and others remained stable. Krystal, the runner-up to Hillary, dropped 231 places to 359, only 26% of Hillary's incredible 864+ plunge. (Please note that the SSA database only lists the top 1000 names, so we don't know Hillary's 2002 rank, only that it wasn't in the top 1000). Only one other name that was in the Top 200 in 1992 ranked lower than 500 in 2002 (Colleen, which tumbled from 192 to 540). This 348 point drop wasn't even within 500 places of Hillary's untouchable 864+ freefall. The worst that any name ranked among those in the Top 250 in 1992, excepting Hillary, was Barbara, which landed at 560, a drop of 325 places. But unlike Hillary, which had been growing in popularity for the 30 years prior to 1992, the trajectories of Colleen and Barbara had been pointed southward since their heydays in the 1950s and 60s. By contrast, the largest one-year drop of another tarnished name from the same period, Monica, was 53 places in 1999; the two-year drop was 73 (1998 - 1999). Monica's dip was short-lived as well, ending with an uptick in popularity in 2002. (Comparison of Monica and Hillary). Against the formidable competition of Ebenezer and Adolph, two poisoned names that had stood the test of time, Hillary fell so quickly as to defy attempts to find parallels. It as if a sprinter clocked the 100 meter dash in 4 seconds, or a golfer completed a round 35 strokes below par. No matter how fantastic those comparisons might sound, they match the blistering speed with which Hillary won the opprobrium of American parents. It is beyond the scope of this study to speculate as to the factors that propelled Hillary to this astonishing feat. It is hoped that sociologists will research this unprecedented case of name poisoning. UPDATE: Several people have suggested that I should have combined Hillary and Hilary in my analysis. They are right. Most sociologists do not consider an alternate spelling to be a different name, especially for purposes of name contamination. Adolph and Adolf are a case in point; Hitler poisoned them both. The reason I didn't combine the Hillary's was that it would have required re-calculating hundreds of other names to reproduce an alternative listing of the top baby names. Not having the resources to undertake that effort, I limited my study to the rankings from the Social Security Administration. Hopefully professional sociologists with superior software and, most importantly, research assistants, will show the results with spelling variations combined. METHODOLOGY: Just as batting averages compare only those with a minimum number of at-bats, I only considered names that were in the top 200. If the threshhold is set at 250, then the alternative spelling Hilary, which was ranked 241 in 1990, would have beaten Hillary for three of the four name poisoning records: biggest one year drop (1993), two year drop (1993-94), and quickest to fall off the charts. The upward inertia of the more popular double-L spelling resisted -- albeit poorly -- the name poisoning. The runt spelling died with the first dose. But because naming experts consider Hillary and Hilary to be the same name anyway, they are truly teammates in triumph. The only possible bases for prohibiting animal cruelty are because either (1) animals have some kind of intrinsic right to be free from interference, or (2) humans have a moral duty to respect animals. Possibility 2 is a religious view that would definitely be unacceptable to libertarians. Which leaves them possibility 1. But if one believes that animals have intrinsic rights (even if they're not equal to ours) and it is the duty of society to protect these rights, then society is duty-bound to protect seals not only from hunters, but from polar bears and orcas! Because human beings have intrinsic rights, the police are obligated to come to my aid whether I'm being attacked by an assailant or an alligator. It doesn't matter who or what is interfering with my right to preservation, the police will help me because they protect my basic rights. If animals had similarly intrinsic rights, it wouldn't matter what was hurting them, man or animal, either. But while the police will stop a man from beating a chicken, they won't stop the fox with a chicken in its jaws (except to protect the property rights of a rancher that owns the chicken). My suspicion is that libertarians think it's wrong for people to kill seals or beat dogs, but don't believe its wrong for an orca to bite off a seal's flipper or for a bear to maul a dog. No advocacy group is pressuring government to protect seals from bears, pheasants from foxes, or rabbits from hawks. This shows that animal rights activists aren't driven by a desire to protect animals' right to preservation or to be left alone, but by the idea that men aren't animals and have special moral duties (aka religion). It isn't only energy policy that's affected by the initialism disease, of course. Environmental policy is nearly paralyzed by it, what with the frequent nonchalant references to "flipma" (FLPMA: the Federal Land Policy and Management Act) or SMACRA (Surface Mining Control and Reclamation Act). Health policy is pretty bad too, what with PPSs, PPOs, HMOs, SCHIP -- pronounced "S-Chip" -- not to mention HIPAA and CLIA, for the truly initiated, many of which are administered by HHS's CMS, whose Web site contains a link to an acronym glossary where you can look them all up. While regulators are the worst -- banking regulation acronyms are so profuse I'm trying not to learn them -- in recent years Washington insiders have also begun to use initialisms even when perfectly good ordinary names are available. Take the vaguely obscene "SCOTUS" and "POTUS," fairly common terms used when the speaker wants to indicate both that he is talking about the Supreme Court of the United States or the president of the United States, and that he is a hip insider who would never use ordinary, plebeian terms such as "the Supreme Court" or "the president." And for the cognoscente there's always "FLOTUS," a reference, of course, to the first lady. It can get confusing. What is the ICC, after all -- is it the International Criminal Court, or the Interstate Commerce Commission, or Maryland's proposed intercounty connector? And why is the NAACP pronounced "en-double-A-see-pee," whereas AARP, the American Association of Retired Persons, is pronounced, simply, "arp"? Could it be because AARP recently changed its official name to Aarp, actually transforming its title from an acronym into a brand-new word? Some pronunciations defy logic altogether -- such as PFIAB, the President's Foreign Intelligence Advisory Board, pronounced "Piffy-Ab." It's always a tricky question whether you should pronounce each individual letter or just say the whole thing as one word. With the National Highway Traffic Safety Administration, for example, not many people would intuit that NHTSA is pronounced "nitsa." There is one agency, however, as to which the answer is fairly clear: Pronouncing FCC as one word could be particularly hazardous, depending on the vowel selected. My friend Roy Englert -- a renowned appellate lawyer at Robbins Russell -- has an article defending the use of amicus briefs in federal litigation. The article responds to a recent provocative opinion by Judge Posner in which Posner claims that "[t]hose who pay lawyers to prepare such briefs are not getting their money's worth." Definitely worth reading. But it was writers-with-a-W who really excelled, doing their best to confute Shelley's grandiose proposition that poets are the unacknowledged legislators of the world. That idea always looked dubious -- in practice writers are all too often sillier and nastier in their politics than anyone else -- and one or two writers were wise enough to recognise this in September 2001. Bret Easton Ellis said that he was too depressed to make phrases, and Philip Roth refused public comment. If only there had been more like them. When asked to contribute to "Authors Take Sides on the Spanish War," George Orwell replied in more than usually intemperate terms: "Will you please stop sending me this bloody rubbish? I am not one of your fashionable pansies like Auden and Spender?" But he had a point, and his biographer DJ Taylor recently declined to contribute to a collection of "Authors Take Sides on Iraq" on similar grounds if with less verbal violence, recognising that nothing he could say was going to make the smallest difference, and wondering why a writer has any duty to be "engaged." It would after all be odd to see a book called "Stockbrokers Take Sides on Iraq" or "Bus Drivers?" and any such collections from literary ladies and gentlemen ought to be prefaced with a warning: an alarmingly high proportion of the eminent writers of the past century veered towards the totalitarian heresies of left or right, attracted by communism or -- in the case of rather more great writers, as it happens -- by fascism. This might not be accidental. Imaginative writers are distinguished not by a sweeter character (too often very much not), greater intellectual honesty, or even deeper intelligence, but -- apart from the gift of expression which is their stock in trade -- a way of looking at the world which is interesting because it is exaggerated or distorted. After an event like 11th September, such expressive gifts might be more hindrance than help; some things are best said simply rather than dressed up in look-at-me prose. Arundhati Roy claimed that it is "the writers, the poets, the artists, the singers, the filmmakers who can make the connections, who can find ways of bringing [the event] into the realm of common understanding"; the evidence suggested the opposite. I read A Matter of Taste: How Names, Fashions and Culture Change last week. It was very disappointing. The topic fascinates me and I was expecting a great book, but I was instead forcefully reminded how poorly trained social scientists are. Even though the author is a professor at Harvard (ouch! ), he makes many amateurish blunders. In an attempt to determine whether celebrities influence naming patterns, for example, he looked for naming spikes after celebrities' rise to prominence. If lots of people started naming their sons Charlton, Marlon and Elvis shortly after Heston, Brando and Presley become famous, we can assume that their celebrity influenced the naming spike. But in the dozens of famous entertainers considered, there was either no spike in the celebrity's name or the spike began before they were famous, suggesting that the entertainer wasn't the force behind the spike. The only spike that fit the hypothesis was the name Gary with the rise of Gary Cooper. So, where does this information lead a Harvard sociology professor? To this probing question: "Why, for example, did the appearance of Gary Cooper lead to Gary becoming an enormously popular name, whereas Humphrey Bogart, Clark Gable, Bing Crosby and Cary Grant (other major stars of about the same period) had minimal effect?" By this point in the book (page 185) I'd become so frustrated with the author, and by extension the editors, social scientists, Yale University Press and Harvard, that I felt like yelling. Gary DID NOT become popular because of Gary Cooper! You just disproved your hypothesis, you nincompoop! If naming spikes happen independent of the rise of celebrities, one should expect coincidental correlations nonetheless. That's what controls are for. Gary just happened to spike as Gary Cooper became famous. Aaargh. It's as though he disproved the significance of Friday the 13th, then scratches his head trying to figure out why someone in Reno was hit by a train on Friday the 13th. Standard encyclopedia articles state that, before going to war, Brubeck studied with Arnold Schonberg, the leading prophet of the strictly academic, highly dissonant compositional technique that dominated "serious" composition in the middle years of the 20th century. Brubeck explains with good humor that he had a one-hour lesson with Schonberg, during which the young Californian and the venerable German did nothing but argue.